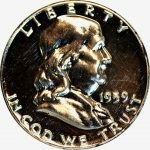 The Franklin Half Dollar was minted from 1948 to 1963. Designed by John R. Sinnock. Due to the coins relatively short mint period, being replaced by the John F. Kennedy Half Dollar after his assassination, this coin never gained a large collector following. This example has the much sought after “Full Bell Lines” on the Liberty Bell on the reverse.